About 70 percent of the earth is covered in water. And that’s just fine with Dr. Paul Boulos. From water quality principles to hydraulics, he is a global authority on drinking water distribution engineering. A native of Beirut, Lebanon, Dr. Boulos graduated with a Bachelor of Science in General Science from the Lebanese American University in Beirut. Following the advice of his cousin who was studying civil engineering at the University of Kentucky, he then moved to Lexington to continue his education. He graduated with distinction from UK in 1985, earning a bachelor’s degree in civil engineering. He went on to earn a master’s degree in 1986 and a Ph.D. in 1989 in civil engineering, also from UK. 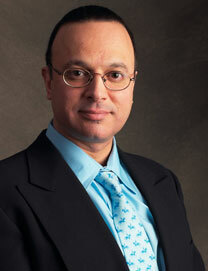 In 2003, he earned an Executive MBA through the Harvard Business School Advanced Management Program. In 1989, Dr. Boulos began a three-year tenure as a visiting assistant professor of civil engineering at the University of Kentucky. In addition to teaching courses in fluid mechanics and engineering hydraulics, he managed funded research and consulting projects and developed widely used computer programs for pipe distribution network analysis. Leaving UK in July 1991, Dr. Boulos joined MWH, a global energy and environmental engineering, construction, and management consulting firm now headquartered in Broomfield, Colorado. He has held a wide array of positions within the company, including project manager, corporate department manager, corporate technical director, corporate director of intellectual property, vice president, senior vice president, operating president, and director. In 1996, MWH Soft was created to provide focused expertise in software solutions to meet the technical needs of water and wastewater organizations worldwide. Dr. Boulos was given the rare opportunity to build and lead its incredible team of professionals and he has served as director, president, and chief operating officer. In only 13 years, MWH Soft has quickly evolved into a diversified, top-echelon engineering software company and one of the most recognizable brands in the field – holding leading positions in the United Kingdom, most of Western Europe, Australasia and the Middle East, and North American water and wastewater industries. Today, some 80% of the largest US cities and many of the world’s best-run utilities run on MWH Soft software. The company’s geographical footprint now spans over 60 countries on five continents. In July 2009, he was given an additional title: president of MWH’s new Middle East region. Dr. Boulos is responsible for driving growth in an area that encompasses the countries of the Middle East as well as several countries on the North African Mediterranean rim. Respected by his peers, Dr. Boulos is one of only sixteen distinguished engineering professionals worldwide to be awarded Honorary Diplomate status by the American Academy of Water Resources Engineers, the academy’s highest honor. The Lebanese American University, on whose board of trustees he serves, honored him as its 2008 Alumnus of the Year. That same year he was presented with the Pride of Heritage Award by the Lebanese American Foundation. In 2009, he was awarded the Ellis Island Medal of Honor, and was made a Fellow of the American Society of Civil Engineers. Dr. Boulos has been honored to serve in leadership positions in a number of civic and professional organizations. Throughout his career, his efforts have led to innovation and breakthrough discoveries. His pioneering work on distribution systems water quality modeling is now an industry standard worldwide. Dr. Boulos lives in Westminster, Colorado with his wife, Katya, and their daughter.